The Funk Heritage Center of Reinhardt College in Waleska was honored this year at the 25th Governor's Awards in the Humanities luncheon. This state-wide program recognizes and celebrates local community organizations and members working to increase the understanding and appreciation of the humanities in Georgia. The award was one of only 12 presented on Tuesday, May 11, 2010, at the Old Georgia Railroad Depot in downtown Atlanta. Georgia Humanities Council Board of Directors Chair Lisa White (left), Governor of Georgia representative Lonice Barrett (second from left), and National Endowment for the Humanities Chair and former U.S. 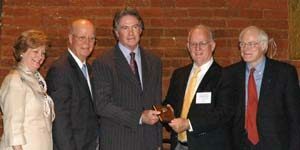 Congressman Jim Leach (right) recognize the Funk Heritage Center at Reinhardt College on May 11, 2010. Accepting the Governor's Award on Center's behalf were Reinhardt Board of Trustees Chair William G. Hasty Jr. '67 (center) and Funk Heritage Center Executive Director Dr. Joseph H. Kitchens (second from right). Hundreds of policymakers, business leaders and representatives of cultural organizations from across Georgia gathered to celebrate the humanities at the annual program. Twelve organizations and people who are doing exemplary work in the field across the state were honored and encouraged to serve as models for others. Award recipients included those who research and develop exhibits on local history or other cultures and those who work in their communities to preserve local landmarks. Those honored see the connection between the past and future of their neighborhoods and communities. By their example, they help us recognize the importance of the humanities in all our lives. Recipients are nominated by the public, reviewed by a committee of the Georgia Humanities Council Board, and ultimately selected by the Governor. The Funk Center is only the ninth museum in the state to receive this award, thus joining the ranks of the Atlanta History Center, the High Museum of Art, the Margaret Mitchell House and Museum, and the William Breman Jewish Heritage Museum. Museum Director Dr. Joseph H. Kitchens was excited about the noteworthy recognition. "This important award recognizes our efforts in offering unique programming," he said. "Although we have a wonderful facility visited by many people each year, our objective is also to provide programs that will be educational and memorable to children and adults of all ages." Since its founding in 1998, the Funk Heritage Center of Reinhardt College has been an important resource for preserving and sharing the stories of Georgia's Native American heritage and the Appalachian frontier with citizens of Cherokee County and beyond. In 2004, Governor Sonny Perdue signed House Bill 865 proclaiming the Center as "Georgia's Official Frontier and Southeastern Indian Interpretive Center. Reinhardt College President Dr. Thomas Isherwood, echoed Kitchen's sentiment. "The Funk Heritage Center preserves a vital part of the history and culture of North Georgia," he said. "In so doing, it protects and maintains our way of life. We are so grateful to the staff who run the programs of the Center on a daily basis but especially to those in the community who through their generosity and support make this possible." The Funk Center has been an important resource for educators and students, providing creative and accessible programs aligned with state curriculum standards, such as the annual Georgia History Timeline held each October. The Center benefits from the service of 65 dedicated volunteers who give of their time and talents because they recognize the important role of the museum in keeping alive the stories and heritage of those who lived on the land. The Center's after-school programs, summer camps, and special events are designed to inspire children and cultivate a life-long love of the humanities. The Funk Heritage Center was founded in 1998 by longtime Reinhardt trustee and friend Dr. James F. Funk, who died in December 2008. Two of his children, Florrie Gonzalez and Helen McSwain, attended the award luncheon. The Governor's Awards Luncheon followed the Annual Humanities Lecture. It was delivered this year by National Endowment for the Humanities Chair former U.S. Congressman Jim Leach.